What is the MyGoldCare™ program? 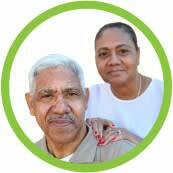 MyGoldCare is Gold Coast Health Plan’s palliative care program that is available for qualified Plan members. Palliative care is specialized medical care for people with a terminal illness. It is a way of providing care that addresses the difficulty of treatment with a unique focus on patient choice and improving quality of life for both the patient and the family. A palliative care team works with patients and families to determine what is most important to them in managing their illness. This type of care is focused on providing relief from the symptoms, reducing the stress of a serious illness, and addressing the physical, intellectual, emotional, social and spiritual needs of GCHP’s members in the most compassionate way possible. Palliative care is provided by a specially-trained team of doctors, nurses and other specialists who work with the patient’s other doctors to provide an extra layer of support and ensure that the patient’s and family’s goals of care align with the treatment options available to them. How does a member qualify? GCHP will provide palliative care services to all members who elect and qualify under the general eligibility and disease-specific criteria of the MyGoldCare program. A provider memorandum that provides descriptions of the covered conditions is located here on the GCHP website. Qualified conditions include, but are not limited to, advanced cancer, kidney failure, chronic liver disease, chronic obstructive pulmonary disease (COPD) and congestive heart failure. If a GCHP member continues to meet the eligibility criteria, they may continue to access both palliative care and curative care. If you believe a patient qualifies for MyGoldCare, the referring provider can refer directly to one of GCHP’s MyGoldCare palliative care providers. A prior authorization is not required for palliative care. Palliative care is used while patients continue active treatment for their medical conditions. Hospice care is reserved for terminally ill patients when treatment is no longer curative during the last six months of life. A patient can receive curative treatment and palliative care treatment at the same time. Advance Health Care Directive Form. Used to name a medical decision-maker if you cannot speak for yourself. You can also say when you would and wouldn't want particular kinds of treatment. Help for Healthcare Agents: A companion piece to the Advance Health Care Directive to help you understand your role as the spokesperson for your loved one. A Palliative Care Approach to Navigating the Family Meeting: An approach towards more effective family meetings during medical crisis, or introducing end-of-life discussions that may provoke anxiety and fear among providers and families. California POLST Form: A physician order that gives seriously ill patients more control over their end-of-life care by specifying the types of medical treatment that they wish to receive. POLST- Frequently Asked Questions for Consumers: A resource for providers to help them answer questions from their patients regarding the POLST form. Facing Serious Illness: Making Your Wishes Known: A guide to the POLST form. Palliative Care Education: The California State University Institute for Palliative Care has received funding from the state Department of Health Care Services (DHCS) to support the education of Medi-Cal providers in how to deliver palliative care. Free of cost for a limited time. Ventura County Coalition of Compassionate Care (VCCCC): VCCCC is a local coalition dedicated to promoting education to health care professionals and the public regarding advance care planning and the understanding of life-sustaining treatments for those with serious illness. You can connect with other professions dedicated to compassionate care and stay up-to-date on relevant resources, policies, and legislation that may impact you and your organization. Centers to Advance Palliative Care (CAPC): The Center to Advance Palliative Care (CAPC) is a national organization dedicated to increasing the availability of quality palliative care services for people facing serious illnesses. National Hospice and Palliative Care Organization: An organization that represents hospice and palliative care programs and professionals in the United States. Ventura County Health Care Agency’s In Home Support Services (IHSS) Program: This program helps seniors and people with disabilities (including children) to stay in their homes. Help is available for qualified applicants to pay for support services, including light domestic help, non-medical personal care, and assistance to and from medical appointments. Ventura County Health Care Agency’s Whole Person Care Pilot Program: The program helps members facing complex medical and social challenges to secure necessities, such as housing, food, and reliable transportation to doctor’s appointments. For more information, contact the Ventura County Health Care Agency at 1-805-339-1122.